The first organ chips are coming to market and, regulators permitting, will speed up drug testing and reduce the use of laboratory animals. Very behind on my posts…. Read my and Paul Markille’s hit story for The Economist (3.5k likes on Facebook and the double page colour lead ) in full below or the original by clicking here. This is the second time I have written about this technology. You can read my first take on it for The Observer here. IN A recently opened laboratory just north of London, an experiment is under way to discover how the liver will respond to an new drug. Normally such a test would be carried out on liver cells cultured in rows of dishes or—as regulators require before approving a drug for clinical trial—in animals such as rats or dogs. But this experiment uses a small device about the size of a smartphone. It contains a miniature liver made from human cells and promises more reliable results. It is one of the first commercial versions of what bioengineers call an organ-on-a-chip. The liver chip, named Quantum-B, was made by CN Bio, a firm spun out of the University of Oxford and now based in Welwyn Garden City. Quantum-B is designed to help researchers find a cure for hepatitis B, a viral infection of the liver. 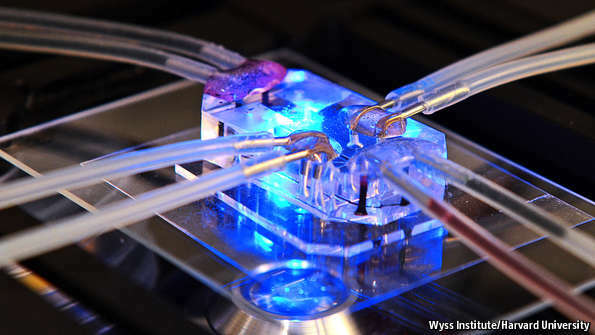 Other groups coming up with miniature organs include, in America, the Wyss Institute at Harvard University, whose devices include a lung-on-a-chip (pictured above), and the University of California, Berkeley, which has a heart-on-a-chip. Chips replicating the kidney, intestine, muscle, fat, bone and skin are also being developed. Subject to regulators, such devices have the potential to slash the use of laboratory animals in drug testing. Animals are not necessarily good analogues for humans because of fundamental differences in biology. Testing on tissue in a dish can likewise prove unreliable because its cells often stop working. The more realistic data promised by organs-on-a-chip could accelerate drug development and allow researchers to carry out experiments too risky for human volunteers. Moreover, by linking different chips together, researchers can study how reactions in one organ affect another. A drug that produces beneficial results in treating heart disease, for instance, might be metabolised by the liver in a way that has toxic results. Indeed, with enough organs-on-a-chip, the twinkle in the eye of some scientists is that one day it might be possible to create the equivalent of a body-on-a-chip. Most organ chips are made out of a synthetic material, such as a polymer. This might be transparent for viewing the cells through a microscope. (Some are made with photolithographic processes similar to those used for computer microchips—which is how they got their name.) The chips contain minute structures to which cultured human cells are attached. Given the right conditions, the cells will naturally arrange themselves as they would in the body and start to behave as if they were there. A technique called microfluidics is used to shuttle a blood-mimicking fluid along channels and tiny pipes, bringing sustenance to the cells. The chips do not contain complete organs, just the smallest colonies of cells necessary to replicate the function of one. CN Bio’s liver chip, which is based on work carried out in partnership with Linda Griffith and her colleagues at the Massachusetts Institute of Technology (MIT), uses tiny “scaffolds” to hold cells from donated organs which, for various reasons, were deemed unsuitable for transplant. The cells can be kept frozen until required. The scaffolds are placed into small wells and fed with a suitable fluid along the channels. After a few days spent settling down, the cells are ready for work and are infected with hepatitis B. As the human form of the disease can be replicated only in primates, dozens of chimpanzees would otherwise be required for just one experiment. Each liver chip, however, contains 12 tiny livers, so it can be used to conduct several tests at the same time. A prototype chip with 36 livers is also under development, says David Hughes, CN Bio’s chief technology officer. The company will license the technology to other laboratories and provide tests for researchers. The price for a basic toxicity test starts at around $22,000. That might seem expensive, but even a straightforward study in rats can take a month or more and cost over $50,000; a more complex analysis can exceed $1m. This is why whittling down thousands of candidate substances to bring a new drug to market can run up a bill of over $1 billion. What makes organ chips potentially so effective in drug testing is that they create not just the biochemical environment necessary for the cells to thrive but also the physical one. For a liver-on-a-chip this means getting the fluid mechanics of the artificial blood supply just right. Previous studies have shown that the way fluids flow across the surface of a cell can affect its ability to function. Other cells may require a mechanical action. Harvard’s lung-on-a-chip, for example, needs to “breathe”. To do that the device is constructed from two microfluidic channels, one above the other, within a flexible plastic material. The channels are separated by a porous membrane which is lined on the top with epithelial cells derived from human lung alveoli, and on the bottom with endothelial cells from blood vessels. The top channel brings air to the membrane and the bottom one contains a bloodlike fluid. Applying an alternating vacuum to either side of the structure stretches and relaxes the cells, just as in the chest of a person breathing. The lung chip was developed by Donald Ingber, widely regarded as a pioneer in the field, and his colleagues at Harvard. The lung-chip, which is about the size of a plug-in USB stick, is being commercialised by a company called Emulate. When exposed to bacteria in the air channel, the device has been found to react as a human lung would if it were infected. Inflammation and fluid accumulation in the lung can also be studied. The Berkeley heart-on-a-chip has a central chamber in which the heart cells are packed together, with microfluidic channels acting as blood vessels. The Berkeley researchers, led by Kevin Healy and Anurag Mathur, say that within 24 hours after the heart cells are placed into the chamber they begin beating on their own at 55-80 beats per minute. After about a week this becomes steady enough for tests to begin. Exposed to standard heart drugs, say the researchers, the heart chip responds in the same way a full-sized human heart would. The Berkeley and Emulate researchers use human induced pluripotent stem cells, which are adult stem cells that can be coaxed back to their embryonic state and then encouraged to become many different types of tissue. This use of stem cells in organ chips raises the possibility of a device that represents an individual patient—a patient-on-a-chip, if you like. In this case all the tiny organs would be derived from a single person: tests could then be carried out on the device to find what combinations of drugs and dosages work best for that patient. So far, researchers are still trying to get just a small handful of different organs to work on a chip. But DARPA, a research agency of America’s defence department, is keen on having ten organs on a body chip. The military interest comes from a desire to have treatments available for nuclear and biological incidents. It is nigh on impossible to experiment with such drugs on human guinea pigs. DARPA and America’s National Institutes of Health are funding $32m of research into a body-on-a-chip at MIT, in collaboration with other research groups, and $37m on a similar project at Harvard’s Wyss Institute. There remains a number of hurdles to overcome, according to a review of the technology by Dr Ingber and Sangeeta Bhatia, of the Koch Institute at MIT, published last year in Nature Biotechnology. The plastic that some chips are made from needs to be improved because it can absorb certain compounds, including drugs, and that might sway test results. For organs linked together, the researchers say, a “universal blood substitute” is needed. This would be a single culture medium that could support all tissues, as blood does. Organ chips will need to be mass produced. In collaboration with researchers working for Sony BioSciences in Austria, Emulate says it has found a material which avoids the absorption problem and would allow its chips to be made in their millions. What that material is, so far, remains a closely guarded secret. Emulate also says it can automate the operation of its chips so that they can be used by non-specialists. It may be a decade or more before organ chips reduce the use of animals in laboratories to any large degree. And some biomedical research might not readily yield to being modelled on a chip at all—complex immune responses in the body, say, or the action of drugs on the nervous system. Yet as the technology improves and becomes better understood, conservative regulators should gain enough confidence in the new technology to start replacing some mandatory animal testing with organ chips.